'When I fall in love' was written by Victor Young and Edward Heyman and was introduced in the 1952 movie 'One minute to zero'. It has since been recorded by lots of artists, most famously (these days) by Nat 'King' Cole and Rick Astley. Nat 'King' Cole recorded his version in 1956. 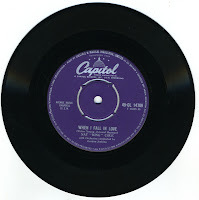 It was released on the album 'Love is the thing' and released as a single in the UK in 1957. It reached number 2 in the UK singles chart. The song was actually re-released in 1987, competing with Rick Astley's version for a chart position. While Astley reached number 2 with his single, Nat 'King' Cole peaked at number 4.